Very impressive, and well done. Wow, that is a large vase. Have you considered dying it and then applying a high gloss finish? Sweet piece, Ron. I think my boring bar would run out of rod before it got to the bottom of one like that!!!!!!!!! Have no idea on how to embellish that vase, really looks great already! 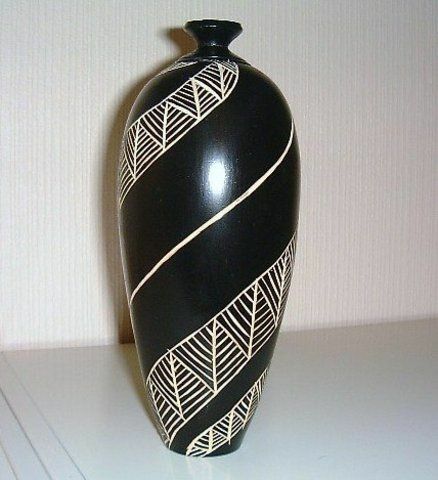 Great looking vase Ron, nicely turned and hollowed. I’m sure however you decide to embellish it will be an excellent result. What do you think the final use of the vase is going to be? Maybe that might help you determine what embellishment you’ll perform. Very nice work. Saw your hollowing rig on a different project, very impressive. Wish I had room for that rig. I have the little brother hollowing system from them and really like it. Everytime I see this type of work, I’m tempted to buy a lathe. Ron, that is a beautiful piece of wood, I would love to see that with a Copper/patina finish. That would be awesome. But I have no doubt that whatever you decide the result will be stunning. Here’s what I did many years ago Ron, but you will probably come up with something far better. It was just painted black and carved with a V chisel. Wow! That’s a vase. I think what ever you do will be awesome. Ron, I see this with a nice hand rubbed oil finish (Tung or Teak), then I would add a fitted lid with a nice contrasting wood finial. It would make a beautiful free standing corner cremation urn. This is just my idea.